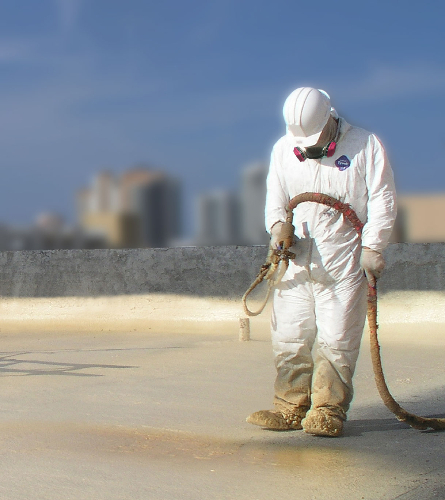 Sprayed Polyurethane Foam is also the best insulator on the market.Very little maintenance or repair is ever needed, and with proper care, it is the last roof you will ever need to buy. 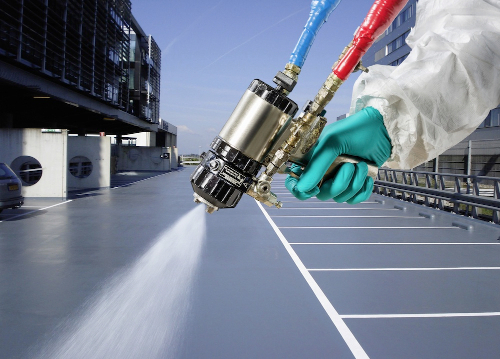 Sprayed Polyurethane Foam is a combination of isocyanate and polyol.These two components are fed through a proportioner which heats then pumps the two separate components to the spray gun, where they are mixed and sprayed onto the substrate. Architects, builders, and owners have created a revolution in the way new buildings are planned and constructed. This revolution has generated awareness in the roofing industry to reveal a “Sustainable Roofing System”for commercial, industrial and residential applications. A sustainable system that doesn’t leak, supports energy conservation, and warrants the confidence of the building owner, engineer and architect. 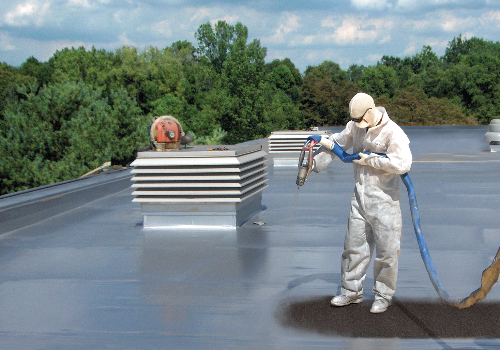 That system is SPRAY POLYURETHANE FOAM (SPF) INSULATION ROOFING SYSTEM. It is a rigid, closed-cell plastic created by a combination of two liquid components, which react in seconds and can be walked on in a matter of minutes. These roofs provide high-compressive strength that increase durability, endure foot traffic, and resist impact and storm damage. With the rising cost of building materials and the eradication of environmental resources it is not feasible or profitable to incur expensive annual life cycle costs or to replace a roof every 10 to 15 years. The life cycle cost of a roof is defined as the present value of all the costs associated with the roof from initial installation until reroof. “Sustainable Roof Systems” are becoming increasingly important. Sustainable Roof Systems preserve natural resources, reduce landfill waste and provide maximum life cycle cost efficiency. 1. 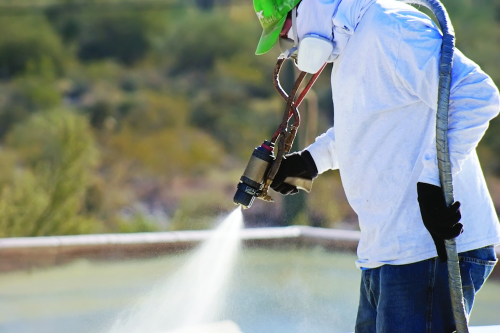 Eliminate Seams and Joints: Sprayfoam’s tenacious ability to adhere to most surfaces; provides a watertight monolithic seal around penetrations, up parapet walls, and other parts of the structure without the use of mechanical flashings. 2. 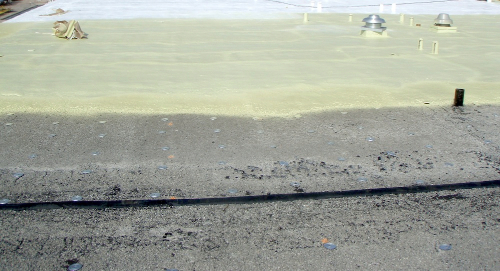 Building Positive Drainage: Polyurethane foam can be sprayed in various thicknesses to create positive drainage and eliminate ponding water. 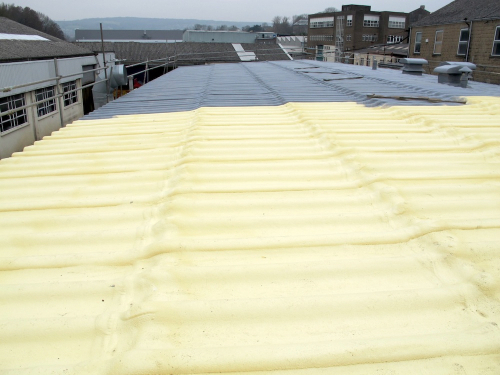 Ponding water is the principal indication of inadequate drainage, “a fequent cause of roof leaks”. Roof leaks accelerate roof deterioration. 3. 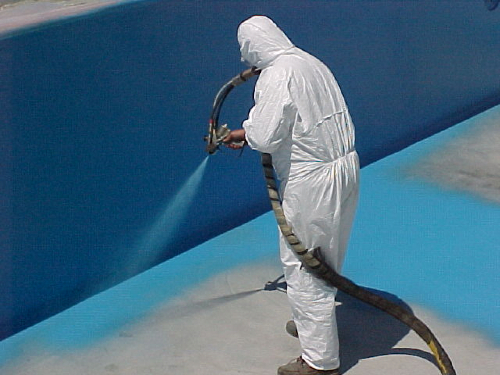 Add a Weather Resistant UV-Coating: After the SPF has been applied to the proper thickness and finish specification, a protective layer of HYBRID POLYUREA is added. This protective layer is extreamly durable and produces a UV resisistant and sustainable surface.